Slope Compactor Roller is designed to be attached onto Excavators/ Backhoe loader. 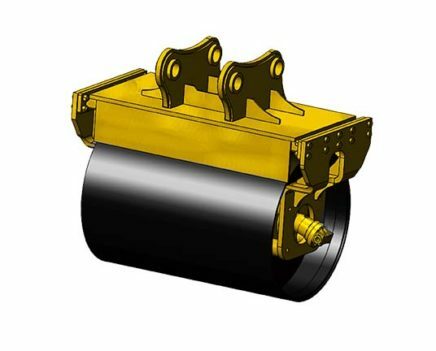 It consists of a vibratory roller which is vibrated through an eccentric shaft while being operated through the hydraulic circuit of the carrier equipment. This is useful at sites where deep soil compaction is required and compaction of slopes such as canals, road-side hills etc and also for the areas which are non-accessible with the conventional compactors. The attachments are available for various carrier models and capacities. Simple plug and play operation. Multiple roller types for different job requirements. Effective compaction of slopes and tricky terrains, with high productivity at lower costs. Useful for compaction of areas inaccessible with conventional compaction methods. Can work in wet and slippery areas where conventional compactors are not usable. Maintenance free design and easy access for replacing vibration dampening pads.